Everything is going as planned, for the most part. With school, the club, and new responsibilities on the horizon, the life Caleb and Isabelle imagines together is so close they can taste it. But their happiness is also a fragile one--all it takes is one wrong turn, one stupid decision and their happily ever after shatters all over the highway. WOW! Let me take a minute to just pick myself up off the floor after reading this! Not enough words can describe how I am feeling, or what this book did to me, but I am certainly going to try! If I could give it a higher rating, I would! Let me start off my thanking K. Ryan for sending me an ARC of Carry You Home! It was like a gem in the ground, and I loved every bit of it! It is for a mature audience, so 18+. This book is going to be released February 9th 2016, so you all need to get your hands on this ASAP!! Alright, diving in head first reading this book, I got a full understanding of what Caleb and Isabelle's relationship was standing at from the end of Carry Your Heart (book 1). From the cliffhanger that was ending from the first novel, I knew I couldn't waste any time, and had to get to reading this one to see where they were going to be at! So right in the beginning, the story of Isabelle and Caleb are as you were left with. Everything all fine and dandy, surprises coming every which way (Good ones!) That being said, when you are in love with someone who is in the Club, you come to terms that your life will never be "normal"
As I kept reading, I knew that a shoe was going to drop. To the extent that it was, was something I don't know if I could ever recover from! Isabelle had everything going for her. All of the things she deserved to have, came crashing down, blow after blow. I felt so much pain for her all throughout the novel, and there were times where I just didn't know what she was going to do. You get to read from both perspectives, and this time around, you find out more about the club and all that Caleb has done, or continues to do for his so called "family". Of course being the reader, I found myself yelling at both him and Isabelle to not go through the hypothetical door, or to finally go after what they really wanted. You can tell that their past history has given them the chance to really know and understand one another, yet they were still filled with surprises. Well thank you so much K. Ryan for ripping my heart out, stomping on it, and then trying to put it back together with some scotch tape!! I can't reveal anything, but there are a few moments throughout the book where I couldn't catch my breath, and I felt so much pain, it was unbearable! Some people who know me well, know that it is really hard to make me cry when reading a book, but let me tell you the tears were trying to force their way out, and I just held them back! All of the destruction, Heartbreak, Heartache, Loss, and Devastation was just too much to handle at times! Having to read moments being taken away, or left behind were probably the hardest moments in the book. I really felt as if I was part of this story, and I couldn't tell you how many times I clutched my chest, literally feeling the pain Isabelle and Caleb were going through at times! There were a few quotes that stood out to me while reading, which of course were pretty powerful when going through the scenes. It would take me, but I knew that at the end of the day, as long as I could lean on this man, who was the glue that help everything together, there would be light at the end of the tunnel." "He was my siren call, beckoning me into dark waters, tempting me to give in, promising me everything but giving me nothing." "I knew he'd do just about anything for me, even if it meant hurting himself." It was such a roller coaster of a ride, going through this book! I mean, I found myself at times hating a few characters and getting so angry with the choices they made, and then instantly feeling guilty or so sad/sorry for them right after. Even Isabelle alone, I found that just when her life was getting better, BAM!! Something just as horrifying and destructive would bulldoze in and knock down everything she was working so hard for, in order to move on! I also really loved the aspect of how K. Ryan ended up writing parts that were months and sometimes years in advance. For most stories, you tend to miss out on what happened, or feel as if it's being rushed, but I didn't get any of that. I felt that it moved perfectly, and I could fully understand why she did it that way, as well as appreciate how she made sure to have the reader know what had been happening in between those years. So much emotion flowing through here, it's definitely leaving a mark! This book hangover may very well last me for a while! Overall these GIF's will have to do most of the explaining! Overall, I absolutely LOVED this book! It was definitely better than the first, even though there was so much more pain and love rolled into it. The writing style was outstanding, and it flowed so perfectly. I couldn't stop turning page after page, consumed by the words and the amount of FEELS you will get between Isabelle and Caleb! So much drama, hate, love, pain and strength coming through, you will not know what to do with it all! It all came to a bittersweet ending, and I love the way it ended! K. Ryan, you got me so good, you are definitely an author who pulls on the heartstrings with no mercy! Love, Love, Love!!! I hope there are more Fangirls out there who have at last read the first book, because I feel like I need some hot chocolate, a big hug, and just curl up in my bed after all of this! 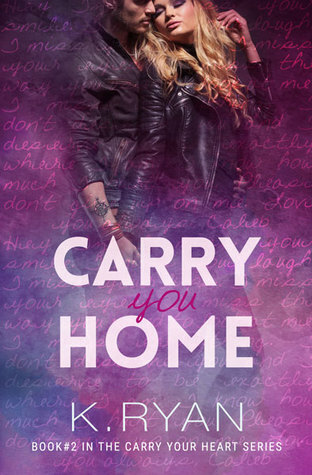 This is my review for Carry You Home! I hope you enjoyed it, and I really urge you all to go check out the series by K. Ryan as they were amazing!